At the Dub Club, Echo Park, California at a screening of “Return of the Rub-A-Dub Style” followed by a performance by Trinity and Tippa Lee. [MV] Trinity, could you talk about when you were first getting into the music, as a youth, when did you first start getting involved? [T] Well, my first involvement in music was in 1971. I done a song for a bredrin named Enos McCloud, Diamonds. [MV] Enos McLeod, yeah yeah. That long ago, 1971? Were you singing back then or Djing? [MV] Was that back when you were still called Prince Glen? [T] Yeah, yes, good, yes! [MV] Even before that, were you always going to sound systems as a youth? [T] Yeah mon, Cynical (?) Weapon, VJ the Dub Master, Soul Hombre. [MV] These are the ones you followed, or the ones you talked on? 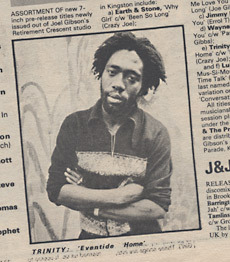 [T] VJ the Dub Master, Soul Hombre, that’s my main two sounds in those days, rub-a-dub sound. [T] Big Youth was my inspiration, but U Roy was before, but when Big Youth come along, you know, I , you know, is not a prefer, but I take onto Big Youth, because, you know, through him was like a messenger, you know, I usually like that, so he was my main idol. [MV] Did you link up with Dillinger back in those days too? [T] Yeah, Dillinger was my sparring partner! [MV] Since how far back? [T] Far back! To August Town we used to walk, go to studio a daytime go voice, Dillinger is the one who bring me in the business. [MV] Where did he bring you first? Enos McLeod? [MV] “All Gone” bad tune! [T] [Sings] “Jailhouse set me free, say wha, I wanna go home, say the rat tun a mouse and you know what I mean? So from there I leave and go to Joe Gibbs. [MV] So Channel One, you recorded a bunch of stuff for them, right, like “School Days” and then there was that album with [Ranking] Trevor, right, “Three Piece Chicken And Chips” was that later, or was all in the first session? [MV] Right, everyone cashing in on that hit. [T] Althea and Donna, Althea and Donna is the same thing. [MV] So what about working with Yabby You, when did you start working with him? [T] Well I start work with Yabby You, bout 1981, somewhere bout 82 . . .
[T] Yeah, because â€“ no, I start work with Yabby You bout 79, because I was working with Joe Gibbs before, “Three Piece Suit” “John Saw Them Coming” â€œStarsky and Hutch” “Judgement Time” and then the album, “Three Piece” album. 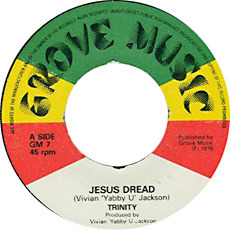 Then I start voice some tune for Yabby You now,”Jesus Dread” um, “If me have a girl and she a run down the world, Gwan and Lef Me” And a lot a tune, me and Yabby You work together so – right now me and Yabby You song big in Europe, like [sings] “Jah jah roam, and chase” you know what I mean, and some other songs. [MV] Because they check for the roots style so heavy there. [T] Yeah, the roots style. [MV] And those rhythms are so heavy too. [T] Right! You hear the big bass, yeah, it’s like a chanting kind of music. 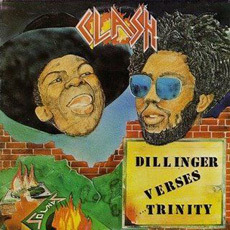 [MV] So, some of the other producers you worked with â€“ you made that “Clash!” album with Dillinger. [T] Yes, that was â€“ we make that album in London, with a guy named Clem Bushay. [MV] Bushay, I was going to ask â€“ could you talk a bit about him? [T] Well Clem Bushay, we went to England, and he was on West End, yeah, and we saw him and you know, usual work for a company, Burning Sound, right, and Burning Sound used to run, want fe do an album. So me and Dillinger get together and voice in London. [MV] So how did you guys go on tour, were you doing a concert tour there? [T] Yeah, we was there to do a tour, a place named Bouncing Ball. And a couple places, Manchester, Redding. [MV] Were the shows with a band or on sound system? [T] Well, band. In those days, cause I like band, but sometimes you have to flexible, y’know? I like band, ’cause band is a thing, when you working with band you can get to do more thing, y’understand, you work with a guitarist and him do him thing, you work with a bassman. But, it cool to work with a sound anyway, because sometime the business change, you have to go with the times. [MV] In terms of working on sound systems, after you started breaking big, after Three Piece Suit, did you continue to perform much on sound systems at the time? [T] No, no, no, afterwards, y’see when you reach certain stage you just pass through, you leave it to apprentice now, and usually pass through and take the mic and deejay fi an hour or two and gi’ it back and mek him rise too, y’understand? [MV] Not on the mic stand until 4 AM! [T] [Laughs] No, no, no, no, I past that stage now! So I start to work out there and, with band now, and start travel a lot so I don’t have time to stay home and really sekkle on the sound system every weekend. [MV] I see, I listen to all those old tapes and it’s always tough to find Trinity or Dillinger on one of those. Except for that Heartbeat, that Skateland session. [T] Yeah! With Heartbeat, right. [MV] So, there’s some other producers, you did a lot of great work for Bunny Lee. 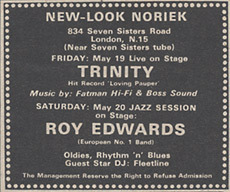 [T] Yeah, I work for Striker Lee, Bunny Lee, yeah, I did an album for him at [King] Tubby’s, and I did a next one for him at Easy Street in London. [MV] What was it like voicing at Tubby’s back in that time? [T] Well it was an experience, beca’ Tubby’s was the dub master, and me usually like work at Tubby’s, because when you work at Tubby’s, is a history, is a history making place, because when Tubby’s name is on the record, the people them all over the world, y’know, want to get it because Tubby’s have that kind of image and that kind of musically, inclined, where the music sound different from the rest of producers. 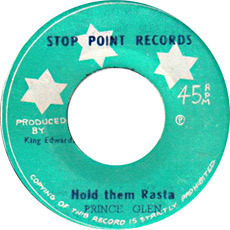 Cause, him a the king fi the rub-a-dub, cause in those days the music did change to rub-a-dub, “boo-boo-boo-boo, boo-boo, boo-boo” rub a dub and – Tubby’s was the king for that. 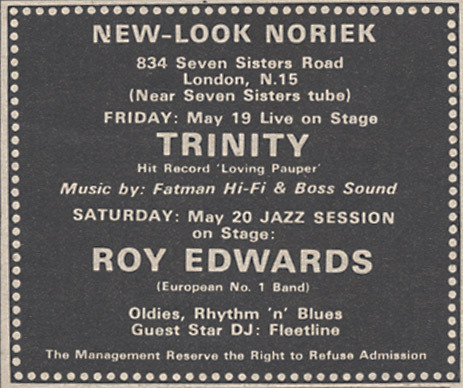 And he could mix it up and put it and go ‘bloo-bloo-bloo’ so Tubby’s was the king where dubplate, is the first place dubplate, rub-a-dub start to establish a big way, y’understand? 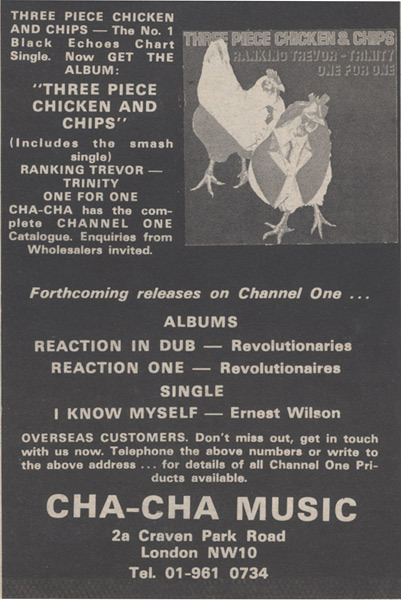 So when you talk about King Tubby’s you talk about dub music. [MV] I see. Would he actually mix it as you were recording vocal sides? [T] No, we voice it first, those days you have four track and two track, so you voice on four track and mix it down to the two track. [MV] So another guy who worked with King Tubby a lot, Carlton Patterson? [T] Yes, I do a song for him, ‘Weatherman Skank’ [edit: actually Weatherman Cap] and I did a couple other songs, me and Dillinger, do some work for him. [MV] ‘Natty Contractor’, ‘Internal Feeling’ too. [T] Right, right, “Internal” yeah, you have the history! [MV] Who else, Niney, you also cut a few songs with him. [T] With Niney, the Observer, yeah. [MV] Could you talk about him a little bit? [T] Well, Niney, we done, I do album for him. [MV] Really, a whole album? [T] Yeah, I do an album for him. [MV] Did it ever release? 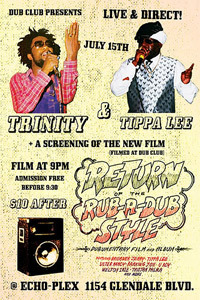 [MV] Oh wow, haven’t heard that one, tonight [at the Dub Club] huh? [T] Yeah, he’s got it, cause he just bought it! 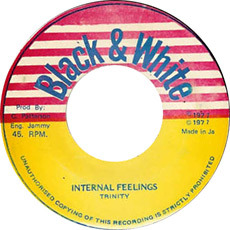 So, Niney’s a good guy, ’cause him have history behind him with Dennis Brown, ‘Cassandra’ and a lot a other songs, so those producers is valued, so if you want to go on good riddims, the vintage kind a riddim, the man I love the vintage riddim, because is not that these riddims don’t properly, but those songs was more having more substance, y’know? And I like tune with substance, instrument and bass, I can’t take the ‘bup-bup-bup’ is not me dat, I like to work on the riddim dem that, y’know what I mean? To have the vibes whe live longer than . . .
[MV] So now with increased interest in foundation material do you think that album will ever release? [T] Yeah, VP is listening to it right now, so anything can happen, I don’t know if them gonna release it, but we just finish it, so what he’s doing now, he’s looking a deal with it, is a good album. Me and Dennis Brown, me and Black Uhuru, me and Linval Thompson, you know. [MV] Linval Thompson, you did some albums for. [T] Yeah, me do an album for Linval Thompson, put out by this company Trojan. [MV] So then in terms of production, you also produce yourself as well, do you want to talk about how you go about your own productions? [MV] Nowadays, yes. Many of the songs on that album? [T] Yeah, all a the song on the album. [T] Yeah, me produce that. “Mr. Greedy” and, you know, the album is me produce. So I do a little producing sometimes, because I like producing, because through sometimes you have an idea in your head, and you want to, put it out there and test your skill, then you have to test your skill from the studio, you can’t test your skill out a road. So, I just get Natty King, carry him in the studio, at Mixing Lab, produce that song and it was number one! [MV] Who were the musicians?